The POKéMON Simulator is a game based on POKéMON for Game Boy. The object is still to catch them all, but this game focuses less on the adventure part of the game. Installer will fit on a 1.44MB floppy disk. Each save game only takes about 100KB. All 386 Pokémon can be caught. You can have up to 10,000 Pokémon at once. Once you catch Mewtwo, a hidden function will be activated! User may select several types of audio and video to play during the game. 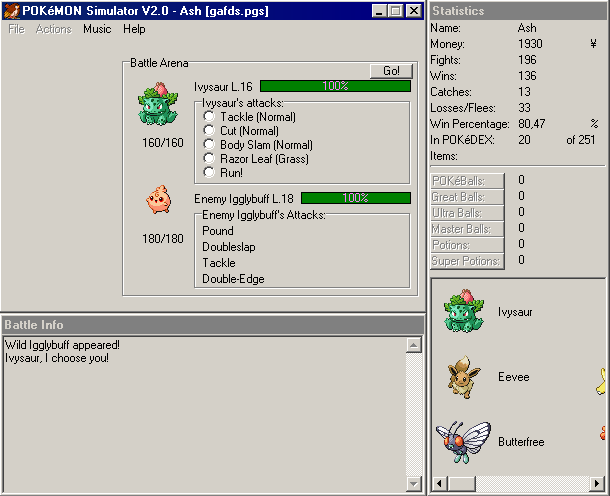 Current version: 4.5 (released 14/07/2004). Version history included in Readme. System requirements: Windows 95 or later, 32MB RAM, resolution of 800x600, mouse. Windows 98 or later recommended. Game can be played in a resolution of 640x480, but it is not recommended.